The CALENDAR IS NOT UPDATED CONSISTENTLY ON THIS SITE. PLEASE FIRST INQUIRE THE OWNER FOR AVAILABILITY. Near Acadia National Park, this private 300 acre lakefront cottage property is a unique vacation. All rooms have magnificent views of the beach, lake and mountains. Perfect for families who enjoy beach activities or for a quiet remote 'get-a-way.' Located adjacent to 38,000-acre land preservation on a minimally developed lake. In 1994 we gifted 7500 acres of the property to the State of Maine for a State land reserve. We kept out the 300 acre peninsula surrounded by the land reserve, where the three cabins are located. The surrounding area is an undiscovered wilderness. The hiking is incredible with tremendous views of Down east Maine and Acadia National Park. There are many remote lakes and ponds snuggled in the hills that provide total privacy. In addition, Acadia National Park is only a short drive away and can easily be visited for a day or afternoon. The Lake and the other surrounding lakes, ponds, and mountains are minimally developed if developed at all. Our peninsula has several additional private beaches within a couple minutes walking distance. Directly in front of the rental cottage is a 1000-foot long soft sandy beach with beautiful swimming. The cottage has a mile long gated private driveway, allowing for considerable privacy. The cottage is fully furnished and decorated in cottage style, yet comfortable. It is very clean and well maintained with electricity and plumbing. It is heated by large fireplace, electric baseboards, and kitchen wood stove. The large property also has Homeaway listing #4017223 and #102874.
english, german, spanish, Not proficient in Spanish or German. The property and the surrounding area are very dear to me and my family. In 1994 we donated thousands of acres to the State of Maine for a Maine State Land Reserve which is now enjoyed and respected by enthusiastic visitors. We work hard to keep our remaining private peninsula pristine and in complete respect to the natural beauty of the area. Andrew grew up in the Bangor and Downeast area and has a strong connection to the Acadia region. The State’s best private beach, cleanest water and swimming, fantastic views and sunsets, well maintained cottage and the proximity to the Maine coast. 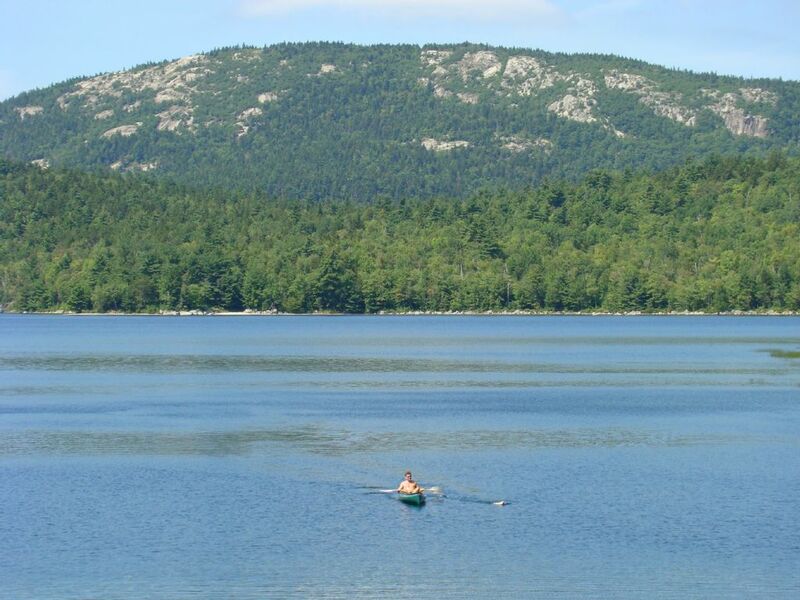 A perfect romantic get-a-way or a memorable family Maine woods, lake and coastal experience! Full bathroom with shower indoors as well as an outdoor hot water shower perfect for sunset showers, rinse off after day at beach or a cool down after a hike on one of the nearby mountain trials. 12 miles to the coast/Acadia National Park's Schoodic Point. Yards from the beach with views directly onto it. 200+ yard private sandy beach. Views of the lake, beach, mountains, sunsets, and natural shoreline. Yards from the shoreline/beach. Views of the lake, mountains, sunsets, and natural shoreline. Yards from the shoreline. Views of the lake, mountains, sunsets, and natural shoreline. There is a shared Landline phone with free national calling. Although extreme heat is a rarity, a window a/c unit can be provided if needed. Heat is provided by use of the field stone fireplace and or electric baseboards. The use of the wood stove is for winter use only as it will over produce heat. One set of linens is provided at the start of your stay for each person staying in a bed. Beds are made fresh just prior to arrival. 18 inch split and dry firewood is provided and reasonably replenished mid week to your doorstep free. It is a satellite service with limited data usage. It is available to use for emails, texts, social media, and general browsing only. PLEASE INFORM Owner if internet/WIFI is requested. A set of bath and beach towels are provided for each occupied bed. Not for use during summer months. All basic cooking pots, pans, utensils, etc are provide for basic cooking. Indoor and outdoor. Child booster seat available on request. Music box with radio, CD and MP3 jack. Also a Buetooth MP3 player for tenant's smartphones etc. 5 adult single person kayaks, One double person kayak, 4 kid kayaks and a canoe are available for guests on our property. Ground level with direct access to living space. Adult and some children life jackets available. Please bring a proper fitting life jacket for your children. The CALENDAR ON THIS SITE IS NOT REGULARLY UPDATED OR MAINTAINED. PLEASE INQUIRE THE OWNER FIRST FOR AVAILABILITY PRIOR TO BOOKING HERE. Staff: Caretaker on call to maintain the safety and operation of the property during your stay. Cottage is professionally cleaned just prior to tenant's arrival. Sundeck; 1000ft private sand swimming beach; canoet; sailboat; 4 single kayaks; One two-person kayak; windsurfer board; fully furnished; all linens; dishes; utensils; cooking appliances; on call caretaker; privacy; private locked gate; spring fed lake water, beach chairs; life jackets; kids beach toys; multiple hammocks are set up around the property..
My wife and I vacationed here for the first time in early October. Warmer than normal temperatures allowed us to enjoy the beauty of the beach and lake and peacefulness of the wooded property. Andrew was great providing information beforehand and Bob, the caretaker, was great while we were there. We're already planning our return for next year. Spring River Lake and this cabin are absolutely wonderful. From the clear waters to the private setting- it had everything we were looking for. We loved using the kayaks to explore the lake and hearing the call of the loons each day. Having the private beach cove was perfect- we enjoyed sitting in the chairs at the water's edge and watching the beautiful sunsets! Our cabin was clean and well stocked with everything we needed to make meals. The bed in the master was quite comfortable! Acadia and the Schoodic peninsula were very close drives and we enjoyed being able to visit them, even though the setting we had at the cabin was our favorite. Andrew was an amazing host who joyfully gave us great advice before and during our trip. His communication was always quick and thorough! He even did his best to make sure we could have a bit of wifi connection for work emails. Thanks so much! What a Great Vacation can't wait for next year. The cabins were perfect! Quiet, private and well kept. Plenty of things to do in and around the lake. The water is crystal clear and the fishing, kayaking and canoeing kept the kids entertained all week. If you want a place to unwind away from it all and relax, This is paradise! What a great experience! Don't just go see Maine foliage and wildlife, live in it for a week. This cabin is warm, comfortable and convenient to Acadia National Park, Lubec and Ellsworth. We will be back. Andrew (the owner) and Bob (the caretaker) were great to work with- prompt and responsive when I had questions. If you are looking for non-stop excitement- go to Disneyworld. If you are looking to spend a week living life the way it was meant to be- fresh air, exercise, good food, restful nights, and a fire in the fireplace when the sun goes down...stay at Andrew's cabin. I guarantee you will NOT want to return to work the following Monday. My wife and I along with our two dogs stayed in the Three Bears Cabin. The cabin was very clean and spacious. The kitchen had all the necessary items including a lobster pot that we used for the lobsters we bought at the shore in Milbridge. We loved having coffee on the deck in the morning while our dogs ran down to the sandy beach for a quick swim. It was great to have canoes and kayaks to use which we used most days to get around the lake. Clear water, sandy beaches, and mountain views made for an enjoyable week. There's several hikes nearby and Catherine Hill Winery is right up the road. If you want to get away (no cable, no TV and no cell service on the property) and unplug, this cabin is definitely a great choice. We will be back to Down East Maine. Ideal spot to relax while enjoying Maine's seacoast, Acadia and surrounding wilderness. One-of-a-kind beach! Few if any completely private fresh water beaches exist like this in New England, especially with such easy access to Acadia National Park and other immediate natural adventures. The Rental Agreement outlines all house rules and payment requirements. A 50% rental fee, tax, a signed or online acknowledged Rental Agreement and a provided home address are required to secure the reservations. The balance of 50% rental fee, the 9% State tax, and the $750 security deposit are due 90 days prior to arrival. Full refund if cancelled 60 days prior to arrival. Deposit are refunded within one week of departure if the property is returned in good condition. Guest check out after 10 am may be subject to $100 per hour late fee. A $100 fee for any excessive cleaning may also be charged. $50 per night charge per person(s) above the person/Guests max. Owner must authorize all guests prior to arrival. Potential Fees may be deducted from deposit if necessary. Alternative Arrival/Departure dates/times must be arranged in advanced of arrival.